JAY-Z has opened up about how he and wife Beyonce came up with such original names for their newborn twins, Rumi and Sir. The music power couple welcomed the new babies into their family in June (17). They also have five-year-old daughter Blue Ivy, though fans have been left wondering why they chose Rumi and Sir as the tot's names. "Rumi is our favourite poet," the rapper confessed. "So it was for our daughter. "Sir was like, man, come out the gate. He carries himself like that. He just came out, like, Sir." In the interview, Jay was also happy to speak about their older sister and her rapping debut on his new album, 4:44. "She got the headphones and she climbed on the little stool, and then she just started rapping," he recalled. "I was like, 'Oh, s**t.' I have (her full freestyle) on my phone. Five minutes! Five minutes of her doing that." Jay, real name Shawn Carter, then confessed he was stunned that she actually knew what she was doing and it had created one of his greatest memories. "She kept doing that 'boom shakalaka, boom shakalaka.' I was like, 'Oh, she understands the concept of a hook," he smiled. The Run This Town rapper recently opened up about his marriage, which has been rocked by rumours of infidelity on Jay's part, and confessed it was the "hardest thing" he'd ever done. 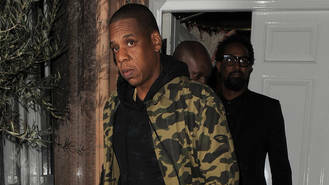 "This is my real life," he told fans on his music streaming service Tidal. "I just ran into this place and we built this big, beautiful mansion of a relationship that wasn't totally built on the 100 percent truth and it starts cracking." "Things start happening that the public can see. Then we had to get to a point of 'OK, tear this down and let's start from the beginning.' It's the hardest thing I've ever done."